This is some deep-level “get off my lawn” talk from me right now. Major League Baseball wants to commemorate all special events with new uniforms. With that money cash grab attempt (with some proceeds going to charity), we have these new uniforms for this season. Chris Creamer from SportsLogos.net has a great recap of everything. I’ll give my thoughts on each design individually. I don’t dig the new looks. 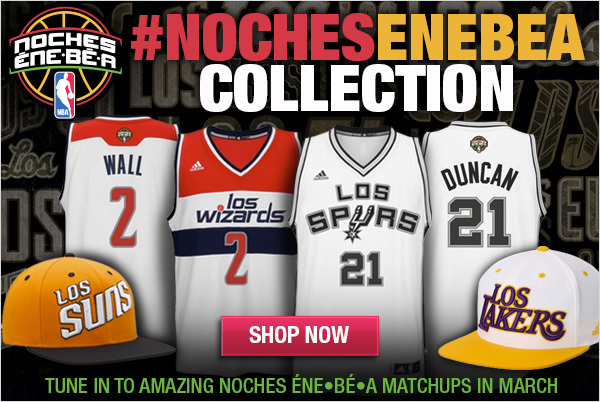 Remember when I was unhappy with how the NBA’s attempt at promoting their Latin Nights with poorly-worded uniforms? I just got an email from them with the above graphic. I just can’t get over the idea that adding “El” or “Los” to a team name makes it Latin. At least, that’s the idea this whole promotion gives me. I get they are trying to do a promotion (and most importantly, sell merchandise) but some actual accuracy would be nice. I still don’t get how “Los Suns” can’t just be “Sols” or “Los Bulls” can’t be “Toros” instead? As I’m watching the Suns and Heat wear their uniforms, I just can’t help but shake my head. But I suppose the NBA will never get it. I’m just glad they didn’t screw up the Chinese New Year uniforms. As some of you know, the A’s are replacing their green jerseys with some new ones. It appeared at that time that it was a step to possibly remove the old identity away and try to establish their new look — possibly for a move to San Jose? Of course none of this was established as fact and was all speculation. But as you can see by the above tweet, print signs and billboards across the East Bay will feature images of the players wearing the old green jersey. Wouldn’t it have made more sense to use images of them wearing jerseys that they still have in circulation? I remember the season the 49ers switched to their current uniform, all images they used were of the players wearing throwbacks. Those throwbacks were very similar to the current uniforms, so the transition there was easy. But to show off the team wearing their old jersey is an old choice given that the team has three other jerseys that are still in their rotation. It’s just an observation. After all, last season the A’s did wear their green jerseys for 81 games, so the pool to choose from was limited. OK, the above photo is pretty cool if you understand the significance of it. Last night, the Heat and Nets wore nicknames on their jerseys. It’s not the first time the NBA has done this, but it’s the first time where every player had a nickname. I actually don’t mind it at all. It doesn’t ruin the aesthetics of the uniforms and it adds a little fun. The only problem, however, is that not everyone has a nickname. Some just seemed so forced. But overall, it’s a fine promotion and it apparently is happening a couple more times this season. Let’s just keep it at that. No need to continue to drag this out. This isn’t the first time social media has been used in team outfits. The Lakers are taking that with their social media night and it’s pretty neat. I am all for handles being used in warmup clothing and so forth, just not for actual in-game stuff. #Embrace the future of marketing.